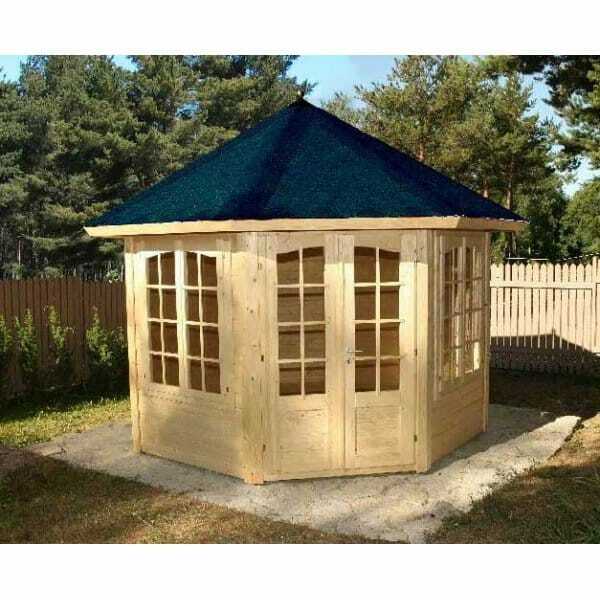 Palmako Carmen Summerhouse: The Palmako Carmen Summerhouse is of a classic and simple design which creates a stunning wooden garden building in a pavilion style. This octagonal summer house features double doors with 4 windows which are usually positioned two to either side of the door; however these can be configured how you like. This light and airy summerhouse would make an attractive feature in the garden. In Common with outdoor buildings, this summer house is delivered untreated and will require the application of a good quality timber preservative. PLEASE NOTE: MAIN IMAGE SHOWS A PARTIALLY TREATED BUILDING.